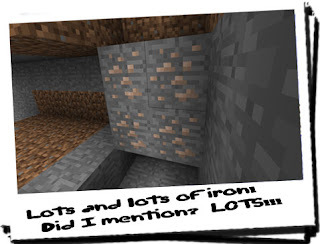 Diary of a Miner: Day 30: AWOL crew and lots of iron! It is possible they were taken by surprise by a storm and swept overboard, but the likelihood of this occurring to every crew member is very low! We equipped them PDA's with trackers placed in them, but we have not received any data back from these devices. Even if they had been swept overboard, there would be a tracker to trace! The only thing we can advise at the moment is to continue with your regular duties and keep and eye out for anything suspicious or mysterious. If needs be, try to explore this 'cave/cliff system' you explained about, and see what you can find. DO NOT put yourself into any unnecessary danger for the sake of the crew! We cannot be sure they even made it to shore! That's pretty much what I did; I continued with the digging in the open-cast mine. Partly because I was still being paid - presumably - but mostly because it took my mind off of things I didn't want to think about! However my adventuring streak is starting to swell inside me, and it'll be a matter of days before I grow bored of a routine, and start looking for mystery! I've found it here once or twice before... there's bound to be more here somewhere! 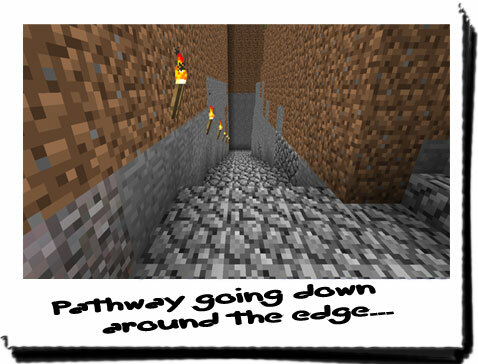 For the moment though, I concentrated on mining; the one thing I knew I could do which wasn't dangerous! I had a good feeling about today: I felt lucky, I felt like I was going to cash in well! However, for the first four hours, all I found was a LOT of stone and dirt. There wasn't even the customarily vast amounts of coal either! It was only when I got down to about ten metres below the surface that the good stuff starting popping up! The great thing about open-cast mining as well is it requires a fully open access, which means a lot of good ore is often found, as well as a lot of dirt, sand and gravel! Within a few minutes of going past this boundary, I had struck iron! A large deposit too! 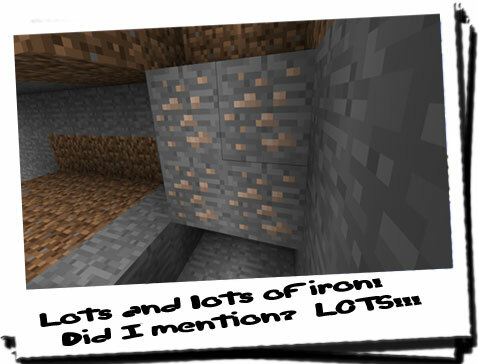 I kept at mining for quite some time; well into the afternoon, and had hit on so many isolated pockets of coal and iron, it was unbelieveable! Every time I had to stop, leave my equipment behind and take it up to the little shelter I made at the top of the mine. This allowed me to store masses of ore without having to stop periodically to take it to the house! Of course, with the amount of stone I had to go through, I ended up going through three different pickaxes! By the end of the fourth, I decided to call it a day and went to check on my findings so far! After expecting the ore I had found, I refined it in the furnace. I managed to get about twenty four ingots of iron from the batch, and was wondering what to do with it all! Using it for tools seemed a waste, and I didn't know whether it was enough to make a minecart track! This would make it considerably easier to get the ore from the mine to the house, but because of the location of the house, it isn't feasible. The other option is run it to the forge. Considerably less track needed and it's a more suitable place! For the time being, I retrieved some leather from the house, cut it into strips and bound large bundles of nine ingots together! With this method done, I only had to cart eight large blocks to the forge, and a few ingots! I went to check on the gate again, and performed the customary ritual of firing a flare into the air! I still hoped they'd made it onto shore, and was tempted to have a search for any evidence of a camp they may have made. There was another option; try to get the ship working, or craft a smaller boat and go looking around some of the other areas around across the large expanses of water! Returning inside and closing the gate, I made sure to check on the farm. There was nothing unusual about it, except the usual hoof prints all over it. I really need to build a gate around that thing! Either that or I could expand it! Wouldn't mind a more regular flow of wheat and reed now and again. Chiron wasn't in his usual place, instead he had somehow found his way up onto the roof! How he got up there I did not now, and stood puzzled for awhile! After a few moments, I joined him watching the sun go down... I wonder where they are? The crew may have been kidnapped! None of the possibilties made sense though! If they had arrived on shore, why did they crash the ship, and if they hadn't made it on shore, why did I find a scrap of black cloth yesterday, caught in the gate? It was very mysterious... and I had a feeling I'd get down to the bottom of it, even if I didn't want to. Something sinister was afoot, and I'd stumble on it sooner or later.